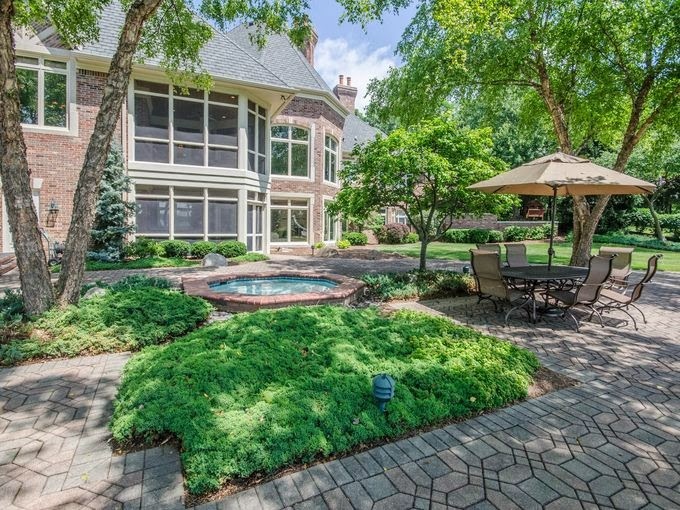 Situated on more than 5 acres, this $4.85 million residence is a sprawling home with 720 feet of water frontage on Geist Reservoir and garage space for six vehicles. The main floor features a large entry with beveled sidelights, a transom ceiling and ornate wainscoting and molding. An elegant inlaid Italian marble floor highlights the area. Arches lead to a sunken great room that is highlighted by an oversized fireplace and windows providing a waterfront view. A screened porch expands the living space. The dining room includes built-in cabinets, a buffet area and large windows. The room is located just steps from the wine closet. An entertainer's kitchen, created by Kitchens by Design, features a curved granite breakfast bar with a prep sink. Appliances include two built-in dishwashers and ovens with convection features, a six-burner gas range with an ornamental limestone hood, built-in microwave and two Sub Zero refrigerators. Floor-to-ceiling windows in a breakfast nook also give a view of the water. The description of the property, which constitutes the entire article, continues on for several more paragraphs. Supposedly it was written by Star writer T. J. Barnes. The end of the article includes a briefer description, that the sales price is $4,850,000, and the listing agent is real estate agent Biff Ward along with Ward's phone number. The online version of the story contains several photographs of the property provided by Ward. Sports coverage is nothing but free advertising for privately-owned teams, after all. Ellen, I don't agree that covering a sports event is even remotely the same thing as running a real estate advertisement as a news story. There is a big difference between reporting what a business does (which is a story) as opposed to publishing a solicitation for business. Newspapers have been covering sports events for well over a hundred years. They haven't been publishing business advertisements as news stories. The latter is a new phenomenon, at least with the Star. i disagree that this is a new low, because the star can't go any lower. biff ward is uber rich, maybe she bought the 'journalist' dinner in return. I guess I am a big confused as to why this article is so shocking to you. These sort of "home of the day" articles have been running for years in both the Star and in many other major newspapers across the country. Yes, they are advertising, but they are also entertainment to those who find real estate listings interesting (I do not want to spend my time reading property descriptions, but I understand many people do, even when they are not in the market to buy a house--or couldn't afford the particular home being featured). At the end of the day, the Star is a private enterprise. If the company decided only to run photos of adorable kittens or run articles on all of Kim Kardashian's ex-lovers, it would be well within its rights. If you don't like the Star, or any particular article it publishes, then simply do not read it, and the problem is solved. With the all the news/commentary sites available on the Web, including blogs such as this one, the Star is simply one of millions of options that individuals can go to for news, analysis and entertainment. I say let it go, and stop reading the Star. The comments are much more pragmatic than Paul's post. Newspapers have always featured boosterism of the most rank and obvious sort.